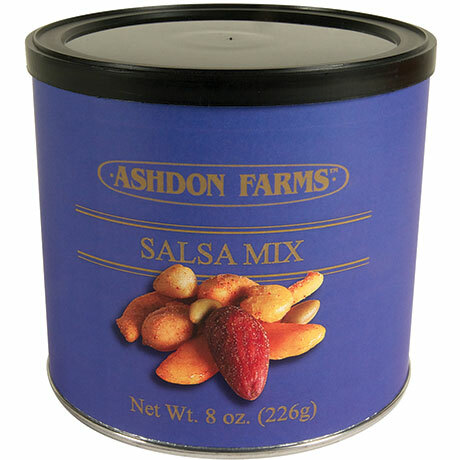 Peanuts, salsa, corn sticks, toasted corn, soy noodles, almonds and pepitas mixed together. Pull-top can with resealable lid. 8 ounces. Contains: Peanuts, Almonds, Milk, Soy, Wheat. May Contain: Other Tree Nuts. Peanuts, salsa corn sticks (corn masa, soybean oil, seasoning [corn flour, tomato powder, dried whey, salt, natural flavors, bell pepper powder, onion powder, spice extract, paprika extract, annatto, torula yeast, garlic powder, beet powder]), toasted corn (corn, hydrogenated soybean oil, salt), chili lime soy noodles (modified wheat starch, soybean oil, soy flour, seasoning [sugar, salt, maltodextrin (corn), chili powder, sodium diacetate, soy sauce powder, natural flavor, citric acid, red pepper powder, spice, disodium inosinate, disodium guanylate, extractives of paprika], sugar, salt), cheddar soy noodles (modified wheat starch, soybean oil, soy flour, seasoning [maltodextrin (corn), salt, whey solids, nonfat dry milk, natural flavor, silicone dioxide (anti-caking agent), cheddar cheese (pasteurized milk, cultures, salt, enzymes), sodium phosphate, anhydrous milk fat, xanthan gum, partially hydrogenated soybean oil], sugar, salt), almonds, pepitas, chili bits (glutinous rice, soy sauce [water, soybeans, wheat, salt], sugar, sesame seeds, chili pepper, yellow 5, yellow 6), salsa seasoning (tomato powder, salt, sugar, onion and garlic powder, spices, parsley flakes, natural flavor), peanut oil, salt.